10 Things You Should Be Doing 8 Weeks Before Your Wedding Day — The Best Events Co.
With just eight weeks to go on your wedding countdown it is completely normal to be feeling super excited, but also for a few jittery nerves to be coming into play too. Now's the time to start fine-tuning your event to make sure that every tiny detail is exactly how you want it. And remember, you'll be absolutely fine, some shotgun weddings are planned from start to finish in less time! 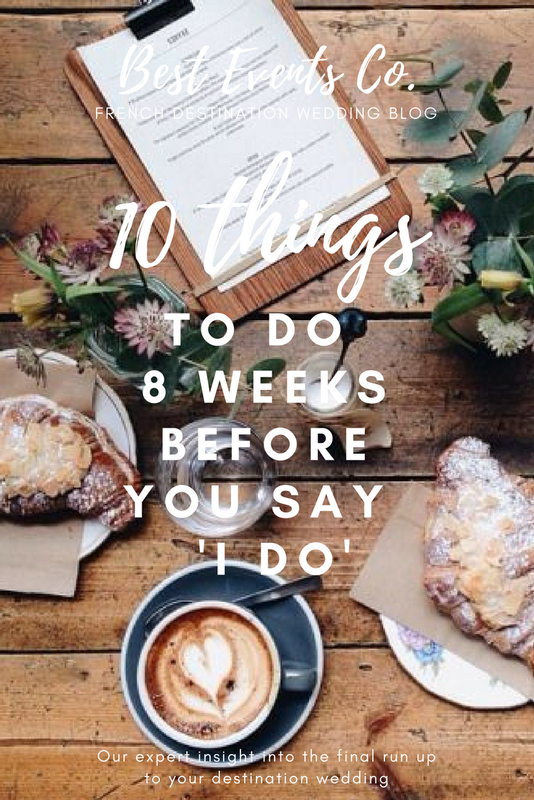 We have put together our top ten things to do 8 weeks before your wedding day to take the pressure off and allow you to enjoy the moment. Review your list of RSVPs and make any updates if you need to. Remember to update your destination wedding planner of any significant changes in the number of guests attending as they will need to inform suppliers to make sure you are not billed for guests who can no longer make it. It's a good idea to get your table plan sorted at this stage, set aside some chilled out time to go over this with your partner. It can be one of the most stressful aspects of planning a wedding and is one of the few things a wedding planner can't do for you sadly! If you have already finished your table plan, take some time to double check it, you may want to do some shuffling around and you still have time to do so. This is quite tricky to arrange especially in a remote location. Often best to ask your wedding planner to arrange as she will have experience doing this. This can be especially tricky for destination weddings so make sure you ask your guests to let you know where they are staying in order for you to arrange transport for them. It's also a good idea to check with older guests and guests who have young children if they would like to schedule an early pick-up time in the evening. We can also provide you with a list of local taxi firms whose numbers you can print on a list which guests can use if required. Hopefully you will have been working together on your playlist over the past few months but now is the time to share it with your DJ and/or band. Equally, make sure you have selected your walk in music for the reception. The French have some lovely wedding traditions that you can incorporate into your day, have a chat with us about those too if it's something you'd like to include. Also try to finalise your first dance music and remember if you are not a natural dancer you can just have a quick whirl around the dance floor then encourage your bridesmaids to get everyone on the dance floor. Music can play such an integral part in setting the feel for the day so make sure you spend some time to get it just how you want it. As your wedding day approaches, your caterer will need to know about any food allergies or dietary requirements. Its quite possible since the invites were sent out that a few of your wedding guests maybe newly pregnant and won't be able to eat soft cheese or rare meat, so that is worth checking. Also let your caterer or wedding planner know if there are any extra vegetarian or vegan meals to be added to your initial numbers. On the day, we recommend marking up some copies of your table plan and giving them to the caterer and their staff so they know where each person with special requirements will be seated. By this stage you will have likely chosen your hairdresser for the big day and will have tried out some styles with them ahead of time. It's still a good idea to have a little trip and have your colour touched up around this time to ensure your hair is in the best shape possible for your hairdresser on the day. It is important to let your wedding hairdresser know if you have made any significant changes to the style of your hair between the time of your try out and your wedding day as they may need to adapt your chosen hairstyle accordingly. You'll undoubtedly be glowing with happiness on your wedding day, but you may also be trying out new products that promise rapid effects ahead of your wonderful wedding in France. We would recommend avoiding new products after the 8-week countdown mark, just incase they make you breakout. If you have a routine that is working for you at the moment, stick with it and keep it up. Most couples choose to buy gifts for their bridal party, gifts vary from couple to couple but try to pick something personal to your relationship with each person. It's a good idea to get these gifts in the bag now as it is one less thing for you to worry about as your wedding day draws closer. Don't forget that you will need to bring the gifts with you, so make sure they are easy to transport - or ask your planner if you can have them delivered to their office. If you want to gift flowers, let your planner know and they can order them from a local French florist or add them to your wedding flower order for you. You will most likely have covered most things by now, so it's great to have some extra time to make sure your day is full of special details. Go over your choice of wedding favours, adding a local delicacy can be a nice touch when getting married in France. Some macarons or a small bottle of Cognac are popular examples. Arrange comfort baskets for the bathrooms at the venue and welcome packs if you have guests staying in self catered cottages. Your wedding planner will be happy to prepare these for you and deliver them as required before the wedding. Also ensure you have some pretty fans and umbrellas for the bridal party, it's best to be prepared. Work with your wedding planner to arrange timings for the day. This often helps couples calm their pre-wedding nerves as they can start to picture how the day will run. Timings are important as they allow couples to emphasise the parts of the day that are important to them. For example, if dancing is your thing, make sure you allow extra time for people to party, if you want the ceremony to be the focus of the day, you may want to allow longer than average time for that. Your wedding planner will be able to advise you on this and will then liaise with suppliers to ensure the day runs like clockwork. Remember, you can always ask on the day coordination if you have not already, it can really take the pressure off if you have someone there to take care of the decorating and manage your suppliers on the day. This is a once in a lifetime process and you should try to enjoy it as much as you can. Planning a wedding in France, or any other destination wedding for that matter, can be extra stressful. But pass on any tasks that you are struggling with to your wedding planner, family and friends to give yourself time to enjoy the process. As stressful as it can get at times, you will want to remember every detail of the experience so take time to document it too, either with photos on Instagram or with a (more traditional!) diary. Older PostPrince Harry and Meghan's Wedding Day - Live Blog!